What does a Goodwill Culinary Institute Graduate bring to the table? 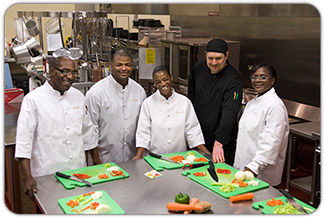 "We have been partnering with the Goodwill Culinary Institute since January 2013, initially participating in their guest chef program, then progressing to a partnership for effective and targeted recruiting. While the Goodwill program focuses on basic skills, it also stresses the importance of work ethics, attendance, continuous education and prepares their students to be successful once placed in the industry. Email Troy Norman for more information at Troy.Norman@goodwillsew.com.